A soldier's first duty is to obey, otherwise you might as well do away with soldiering. 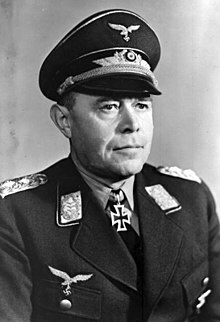 Albert (or Albrecht) Kesselring (30 November 1885 – 16 July 1960) was a Luftwaffe Generalfeldmarschall during World War II. He was one of the most respected and skillful generals of Nazi Germany. He commanded air forces in the invasions of Poland, France, and the Soviet Union, and the Battle of Britain. After the war he was tried for war crimes and sentenced to death. The sentence was subsequently commuted to life imprisonment and he was released in 1952. To Leon Goldensohn, February 4, 1946, from "The Nuremberg Interviews" by Leon Goldensohn, Robert Gellately - History - 2004 - Page 322. War is possible only if you have a lot of enemies. If all the enemies get together and form one front - if you cut down the number of enemies - there would be no war. To Leon Goldensohn, February 4, 1946, from "The Nuremberg Interviews" by Leon Goldensohn, Robert Gellately - History - 2004. I have always had plenty of friends, and now at age sixty, I face four walls as a common prisoner. A military leader often faces a situation he has to deal with, but because it is his duty, no court can try him. Understanding of other nations does not mean a feeling against your own country. That's the whole trouble with Germans. They can see only their own country, the local church steeples only. If only German youth could go abroad, and youth from other countries come to Germany. You always have to have criticism if you wish to become better. June 17, 1944. Quoted in "Mussolini: The Last 600 Days of Il Duce" - Page 131 - by Ray Moseley - History - 2004. Allied air power was the greatest single reason for the German defeat. Quoted in "Tail-End Charlies: The Last Battles of the Bomber War, 1944-45" - by John Nichol, Tony Rennell - History - 2006. ...it was nearly a crime that they came launch to the attack, mainly because they were incapable of counterattack... and they fell, one after the other, easy prey under the Germanic blows of hunting. It is the duty of all troops and police in my command to adopt the severest measures. Every act of violence committed by partisans must be punished immediately. Reports submitted must also give details of countermeasures taken. Wherever there is evidence of a considerable number of partisan groups a proportion of the male population of the area will be arrested, and in the event of an act of violence being committed these men will be shot. June 20, 1944. Quoted in "Mussolini: The Last 600 Days of Il Duce" - Page 131 - by Ray Moseley - History - 2004. About mid-day, Kesselring telephones me and tells me that we shall probably have to wait three or four days before our large-scale counter-measures begin to get under way. Until then there can be no major shift of developments in our favour. Kesselring is nevertheless in good heart. He is assured and full of character in his estimate of the situation and there is not a trace of defeatism with him. He tells me also that the attitude of the civil population has somewhat improved under the influence of our propaganda. Joseph Goebbels, diary entry, April 1, 1945. This page was last edited on 24 September 2018, at 20:11.